Doug Davis began barnstorming after serving as a military instructor pilot. Coney Island’s sandy beach was jammed on the sultry Fourth of July in 1926. Newspapers estimated the number of 600,000, a crowd that included Governor Al Smith, who strolled the boardwalk shaking hands with his holidaying constituents while photographers took pictures that would appear in the next Sunday’s rotogravure sections. Suddenly overhead there appeared a low-flying biplane from which tumbled hundreds of tiny parachutes, each bearing a small candy bar in a red and white paper wrapper. This set off a stampede as the bathers scrambled for a share of the sweets. Douglas H. Davis grew up on a farm in central Georgia. He was a high school senior in 1917 when the United States entered World War I. Without waiting for his diploma, he enlisted in the Army Air Service, with visions of participating in the aerial dogfights over France that were described so vividly in newspapers and magazines of that day. A disappointed Lieutenant Davis spent the next year in the instructor’s cockpit of a Curtiss JN-4D trainer. Like many other military pilots, when the war was over he seized the opportunity to buy a surplus Jenny from the government for a few hundred dollars. From a pasture field near his hometown of Griffin, Ga., with occasional visits to nearby towns, he made a tidy living the next summer by taking passengers for 10-minute rides at $5 each. Sensing potential profits in the new field of aviation, he moved to Atlanta and started his own flying service, building a hangar at the Candler race track and persuading an Ohio airplane manufacturer to grant him the Georgia distributorship for Waco airplanes. He sold his Jenny and bought three Wacos, which he used as demonstrators during the week and for barnstorming excursions throughout the southern states on weekends, hiring former Army pilots to join in what became the Doug Davis Flying Circus. In addition to his own demonstration of aerial acrobatics, his thrill show included a wing-walking exhibition by a glamorous daredevil, Mabel Cody, billed as the niece of “Buffalo Bill” Cody. About this time, Doug Davis’ blossoming career as an aviator crossed paths with the career of a Chicago candy maker, Otto Y. Schnering. It was a fortunate coincidence for both. Schnering not only knew how to make tasty confections, he knew how to sell them, and was recognized as one of America’s most imaginative and promotion-minded businessmen. As president of the Curtiss Candy Company, he had developed a chocolate-coated candy bar that combined roasted peanuts, corn syrup and a half-dozen other ingredients. He needed a catchy name and a novel means of introducing it to the public. Babe Ruth was the best known name in the country—better known even that President Harding or General Pershing—but Schnering had no intention of paying royalties to the baseball idol for the use of his name. So, he did the next best thing, according to oft-told legend. There happened to be a baby named Ruth among Schnering’s relatives so he professed to be naming the baby in her honor (other reports say the candy bar was named after “Baby” Ruth Cleveland, the first-born daughter of President Groveland Cleveland). The five-cent Baby Ruth candy bar, with a red and white wrapper, was born in the Curtiss candy kitchens in Chicago. Next, the idea was conceived of harnessing the nation’s love of baseball to the growing popularity of the airplane. What better way to introduce Baby Ruth candy than to have it dropped from the skies? His search for a reliable pilot for his promotion stunt led him to Atlanta and Doug Davis. They made a deal; the name, Baby Ruth, was painted in large bold letters on all three of the Davis Wacos and the barnstorming operation took on the name of the Baby Ruth Flying Circus. Wherever the circus appeared, the candy bars were dropped on the assembled crowds, each bar attached to a small parachute made of rice paper. It was an advertising blitz unlike anything the country has ever seen. The Baby Ruth airplanes ranged over 40 states, dropping candy on county and state fairs, racetracks and bathing beaches. On their wedding day, Doug Davis and his bride, Glenna Mae, set off for their honeymoon in one of his “Baby Ruth” biplanes. A Curtiss publication described a day in Pittsburgh in 1923, when automobiles were crisscrossing the business district noisily, people were walking on the sidewalks and others were at work in plants and offices. Over the city, an aviator named Doug Davis glanced down with a sly smile. “Within five minutes, Pittsburgh was a screaming pandemonium,” the publication said. “Doug Davis was roaring through the business district, a few dozen feet above the streets, looping, rolling and swooping between buildings. Upper-floor office workers experienced the sensation of hearing a roar; glancing out the window, they saw a flying machine a few feet away. People rushed to the streets and rooftops. Children ran out of schools, drivers left cars standing at intersections. Traffic was jammed for blocks and blocks and blocks. “When he was absolutely certain that he had Pittsburgh’s attention, Mr. Davis did what he’d been hired to do. He climbed to the proper altitude and dumped his cargo overboard. Down upon Pittsburgh rained hundreds of tiny parachutes—each carrying a five-cent Baby Ruth bar. The pandemonium was doubled. People risked falls from windows reaching for the parachutes. Children ran out into the streets (without danger—traffic was hopelessly snarled) and adults fought for the free candy. When Davis flew into Miami to spill candy bars on Hialeah racetrack, he found a young volunteer to pitch the candy bars from the cockpit. His name was Paul Tibbets. His father operated a wholesale confectionery business and was southern Florida’s principal distributor of Baby Ruth candy. It was the first airplane ride for the boy, who, years later, would pilot the aircraft that dropped the world’s first atomic bomb over Hiroshima. In every city and town he visited as a barnstormer, handsome Doug Davis was flirtatiously pursued by the flappers for whom the post-war decade is remembered. However, friends recall that his sole romantic interest was a girl back home in Atlanta—Glenna Mae D’Hollosay. They corresponded while he was in the service and resumed dating after the war. His first plane was named for her; “Glenna Mae” was painted in bold black letters below the pilot’s cockpit. They were married on Christmas Day, 1925, and promptly set out on a honeymoon in one of the Baby Ruth airplanes. Meanwhile, behind a small desk in one corner of the cluttered hangar at Candler, the pilot was becoming a hardheaded businessman, making money with the sale and repair of planes. The weekend barnstorming forays were also earning a profit, sometimes grossing as much as $3,000 in a single day. He become known throughout the South as the “king of the barnstormers,” his only serious rival being Ivan Gates, a colorful cigar-chewing operator of a flying circus of similar size. On the first day of the races, Davis flew the R613K to a first-place finish in an event for experimental aircraft. Later the same day, he led a four-man team to victory in a relay race, flying a Travelair biplane powered by an OX-5 engine. He and his team had to settle for second place, however, in acrobatic competition. By the time of the Labor Day climax, interest among aviation people was at a peak over the still-hidden Mystery Ship that Davis would fly in the free-for-all for planes of unlimited horsepower, an event for which Charles E. Thompson of Thompson Products had offered a large silver cup and $1,500 in prize money. Even so, the military services were the favorites, having dominated the free-for-all event in previous years. A duel for first place was predicted between Army Lt. R.G. Breene in a Curtiss P3A pursuit plane and Navy Lt. Cmdr. J.J. Clark, flying a Curtiss Hawk. Davis was one of five civilian pilots entered in the 50-mile-race over a 10-mile triangular course. Lt. Breene was off to a fast start but by the time the first pylon was reached, Davis and the Mystery Ship had moved ahead. Then, for the next two laps, the Georgia barnstormer stretched his lead, until, at the start of the third lap, he cut inside one of the pylons, an error that would disqualify him unless he turned back at once and re-circled the red and white tower. Without hesitation, he put the little monoplane into a vertical bank and spun around the pylon, a maneuver that put him back in the race but no longer in the lead. 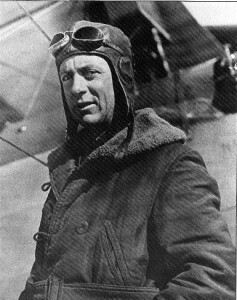 With 30 miles to go, he pushed the little monoplane and its Whirlwind engine to their limit, passing the other competitors including Lt. Breene and Roscoe Turner, to cross the finish line two miles in front of the Army plane and eight miles ahead of Turner. His speed of 194.9 miles an hour set a new closed-course record. The 1929 National Air Races are remembered today as a milestone in aviation history because they marked the first time that a civilian airplane had bested the military. Less than two months after the 1929 races, Travelair merged with Curtiss-Wright and Walter Beech moved to New York as the company’s vice president in charge of sales. Davis became manager of Curtiss-Wright’s southern territory. With this new commitment, he and his Atlanta business partners sold a small air service they had started under the name of Davis Air Lines to Texas Air Transport. Under Davis’ management, it had operated between Atlanta and Birmingham. A victory wave from Doug Davis and congratulations from Vincent Bendix at the end of the1934 Bendix Trophy race from the West Coast to Cleveland. 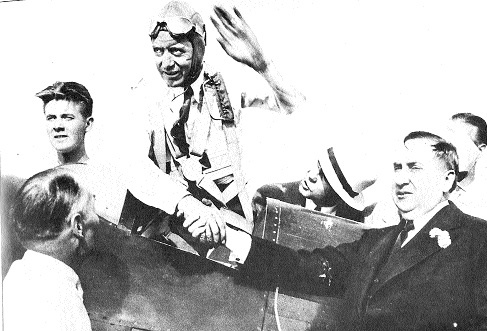 around the country and broke many speed records, among them a four and one-half hour flight from New York to Atlanta. When Harold Pitcairn began flying the mail between New York and Atlanta in 1928, he recruited pilots in Georgia, most of them former barnstormers. Davis was approached with what he conceded was a tempting offer, but he chose to remain with his successful flight service. However, when Pitcairn’s operation was transformed into a passenger-carrying service under the name of Eastern Air Transport, he found it impossible to turn down an offer to become Eastern’s premier captain. The airline reaped dividends in the form of newspaper headlines, for the name of Doug Davis was already well known in the world of aviation. On Dec. 10, 1930, Davis was at the controls of a new Curtiss Condor on its initial scheduled flight from New York to Atlanta, with stops at Philadelphia, Baltimore, Washington, Richmond, Greensboro, Charlotte, Spartanburg and Greenville. A large crowd was on hand at Candler Field when Davis landed after a trip of seven hours and 45 minutes, a time that included the eight stops with a 30-minute pause for lunch at Greensboro. The Curtiss Condor was an 18-passenger biplane with soundproofed cabin that, it was claimed, reduced the interior noise level to that of a Pullman railroad car. Powered by two 12-cylinder engines, its top speed was 147 mph. Because of his fame as a pilot, Davis was assigned to other inaugural flights as the airline expanded its operations. The story is told of an 80-year-old woman passenger who flew from Atlanta to Miami on one of his early trips. It was her first airplane flight; as was his custom, the pilot took time to greet every passenger personally. When it came time for her to return home, the woman politely informed the airline reservations clerk that she would travel only if Davis was flying the plane. She was booked on his next flight, even though it meant a two-day delay. While Eastern did not hesitate to capitalize on its most famous pilot’s reputation as an air racer and acrobatic headliner, the company may have had occasional misgivings. At a time when airlines were striving to convince a skeptical public that flying was a safe and dependable way to travel, they had a nationally famous daredevil in the cockpit. Nevertheless, Captain Doug Davis, the airline pilot, bore little resemblance to Doug Davis, the air racer and stunt flier. The death-defying instincts that drove him to new speed records and hazardous aerial acrobatics disappeared when he took the controls of a Condor or Kingbird. He flew airliners strictly by the book. Weekends frequently found him taking off in one of his own planes for some distant city where an air race was being held. When there were no races, he would practice acrobatics by the hour in his special-built NC612-K Wright-powered Speedwing Travelair. At Chicago’s National Air Races in 1930, he did not enter the Thompson free-for-all, but took part in the daily aerobatic competition and, at the end of the week, was awarded first prize for his rolls, loops and spectacular tumbling performances. Fate gave Doug Davis his next chance at air racing glory in 1934, when he was invited to fly the fastest of three Wedell-Williams planes in the Bendix cross-country event and the Thompson classic at the National Air Races in Cleveland. 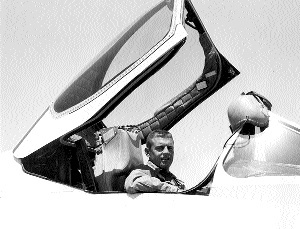 Jimmy Wedell, the plane’s co-designer, had been killed in a crash a short time before. Davis eagerly accepted and obtained a leave of absence from his duties at Eastern Air Lines (the new name for Eastern Air Transport). He picked up the racing plane and flew to Los Angeles to compete in the Bendix dash to Cleveland. “I’m going to win enough money to buy a farm,” he told a friend, John Howard, before his departure from Atlanta. 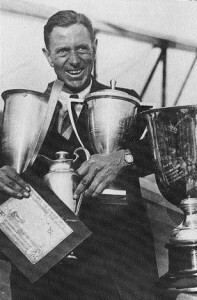 Doug Davis with numerous trophies won in the 1930s acrobatic and racing entries. The Wedell-Williams “44” was an air race pilot’s dream plane. On the fuselage was painted the boast, “Hot as a .44 and Twice as Fast.” Despite its performance capabilities, the plane was known to develop a wing flutter when the engine was at full throttle. On the Bendix flight from Burbank, Calif., to Cleveland, Davis encountered trouble with the stabilizer trim as he battled turbulence and rough weather. After stops at Goodland, Kansas, and Lansing, Ill., he flashed across the finish line 36 minutes ahead of J.A. Worthen, flying another Wedell-Williams plane, to the cheers of 34,000 spectators at Cleveland Airport. Mary Pickford presented him with a trophy and Vincent Bendix presented him with a $5,400 check. In the week of racing that followed, Davis won three more events and thrilled spectators with a 306.2 mph straightaway speed dash. As the day of the Thompson Trophy race approached, a duel was anticipated between Davis and Roscoe Turner, who, after losing the Bendix race, had continued to New York, setting a new coast-to-coast record of 10 hours, 2 minutes and 57 seconds. At a breakfast for pilots on the morning of the Thompson, Davis was critical of the race management for having shortened the triangular course from 10 to eight and one-third miles in order to give spectators a better view of the planes in their 12 low-level circuits of the three pylons, each requiring a steep turn of 120 degrees. “Someone may get killed this afternoon,” he said, observing that the course was too short for high performance planes flying at low altitude. Eight planes took off at the start of the race, with Davis pulling in front as they left the scattering pylon, and Turner in close pursuit. The Wasp engine of No. 44 was performing perfectly and Davis had stretched his lead to a little more than a mile as he entered the eighth lap, almost two-thirds of the way through the race. At that moment, he drifted inside the No. 2 pylon. At high speed and low altitude, the red and white checkered pylons become a blur to the racing pilot, looking through heavy goggles from an open cockpit with the wind beating against his face at every turn. The same mistake had cost Turner the race the previous year. There was no choice but to re-circle the missed pylon, a time-consuming maneuver that would put his rival in the lead, but Davis was confident that he could catch up in the five laps remaining. After all, his plane had out-sped Turner’s by 11 mph in the straightaway speed test two days before. To make the turn with a minimum of lost time, Davis whipped the plane into an almost vertical bank from which he never recovered; the fast little craft was thrown into a high-speed stall and spiraled to the ground. The heroic pilot perished instantly in a mass of flames but the crash occurred out of view of the 60,000 spectators who were told by the race announcer that he had been forced to bail out. Turner went on to win the race and the $4,500 first prize at a speed of 248.129 miles an hour, but there was no victory smile on his face as he accepted the handsome silver trophy from Fred Crawford, president of Thompson Products. Doug Davis was one of the best-loved figures in aviation and the flying fraternity had lost a hero. There is a postscript to the Doug Davis story, also tragic. Doug Davis Jr., who was six years old at the time of his father’s death, served two years with the Army in Europe after World War II. His interests turned to art rather than aviation. In 1949, he graduated from the Atlanta Art Institute, after which he studied at the Sorbonne in Paris under the GI Bill. He specialized in portrait and figure painting and was commissioned to paint portraits of many socially prominent people on both sides of the Atlantic, including Mrs. Walter Chrysler, the Countess Grace d’Aatier, and the Belgian princess Elizabeth de Croy. He also painted a number of murals, both overseas and in this country. One is still to be seen in the American service club at Frankfurt, Germany, and another at the Surf Club of Miami. In the mid-fifties, he opened a studio in Paris; his work soon came to be admired by the international community on the continent, where he was regarded as one of the world’s most promising young artists. He traveled in artistic and literary circles with a coterie of friends that included Edith Piaf, the Parisian chanteuse, and the American poet-philosopher, Rod McKuen. He was approaching the peak of a successful art career, when, in 1962, a group of 105 Atlantans, including many civic leaders, took a charter flight to Europe to visit museums and points of cultural interest. Among those making the trip were a number of Doug Davis Jr.’s hometown friends who persuaded him to return with them; the Air France Boeing 707 crashed on takeoff from Paris’ Orly Field on June 3, 1962. Doug Jr. was 34—one year younger than his father was when he was killed. His friend, McKuen, remembered him with a number of poignant verses.